Even though USD and South Dakota State University have been long-time rivals, the clash of the colleges hasn’t stopped these couples from transcending the feud and finding love. 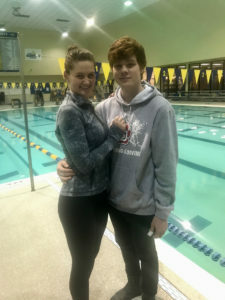 Morgan Dickinson and Mark Malinovskiy started dating when they were neighbors in their hometown of Blaine, MN and swimming on the same high school swim team. However, they chose different paths for their higher education. Dickinson is a freshman computer science major and swimmer at USD while Malinovskiy is a junior mechanical engineering major at SDSU. As for the rivalry between the schools, the couple said they try not to worry about it. On the other hand, they said their friends sometimes criticize them for dating someone from the other school. The couple said they sometimes feel nervous about wearing their school colors on the other’s campus because they would stand out in the crowd. “It’s the funniest when I’m wearing USD stuff while I’m in my own town, Brookings,” Malinovskiy said. After they graduate college, Dickinson said they hope to go to the same town for either graduate school or to work. The couple said some advice they have for any other students in the same type of relationship is to get homework done before taking weekend visits, but also appreciate where each other lives. 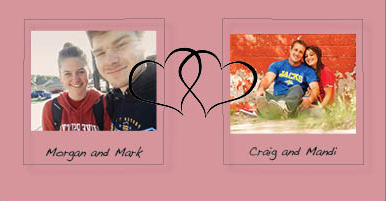 Craig and Mandi Holbeck met in 2013. Craig had already graduated from SDSU in 2012, but Mandi was still in school at USD. She graduated from SDSU in 2014. About two years after they met, they got married and moved to Armour, South Dakota. The couple still teases each other about the rivalry even after graduating. “I’m way more (outspoken) about it than he is,” Mandi said. The couple said they’ve gone to some rivalry games together since graduating, however they don’t always wear their respective school colors at the games. Mandi said Craig’s brother lives in Brookings, so they will sometimes go to the games with him. Craig said he was the same way whenever Mandi’s sister, who used to work at USD, would get them tickets to games in Vermillion. However, they said they do wear their school colors when they go to the Summit League games. Mandi teaches middle school math at the Armour middle school and Craig teaches high school math. Mandi is also the high school volleyball coach and Craig is the high school boy’s basketball coach. They said the school has formed their own USD and SDSU rivalry. The couple said their students and community members often give them “house divided” items like shirts and posters. “We do a lot of recruiting for the schools,” Craig said. Four months ago, they had their daughter Makenna, who they said they try to keep neutral. Mandi said right when Makenna was born, USD and SDSU played against each other in a football game, so they kept her in neutral colors. 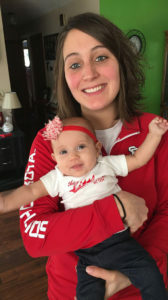 “After the USD win, I let her wear red the next day,” Craig said. Makenna now has a onesie with both a Jackrabbit and a Coyote paw on it that she wears at games. As for where she will go to college when she’s older, Craig and Mandi said they will leave that up to her.